Comedian Stephen Colbert and Connecticut Senator Christopher Dodd had a friendly and funny war of words on Comedy Central's "The Colbert Report" Tuesday night. Leave it to Stephen Colbert to explain campaign finance reform in less than seven minutes and make it funny. 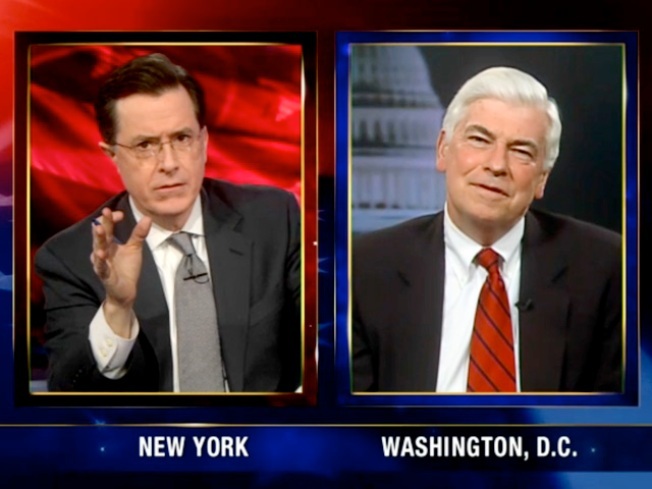 Colbert began his debate with U.S. Sen. Chris Dodd and referring to him as "Senator and corporate segregationist Chris Dodd." Dodd wants to reverse the U.S. Supreme Court's recent to roll back restrictions on corporate spending ruling on campaign finances and took that fight right to Comedy Central late night television on Tuesday night. In true Colbert Nation fashion, Colbert started the discussion about the national issue with humor. “I have always fought for freedom of corporate speech. That is why mine was the very first presidential campaign to be sponsored by a snack chip,” Colbert said, with a screen up showing a logo for the Colbert Nacho Cheese Doritos 2008 Presidential Campaign. “Sorry Senator, we financial entities have tasted freedom and we are not going back. We have been to the mountaintop and we’re going to build a nice chalet up there,” Colbert said. Dodd went back and forth between smiling and being serious, presenting a possible world where Senators could be branded by their campaign contributors. “You might end up having Senators actually have with logos on their coats, like they do in NASCAR races,” Dodd said. ... “Elections would become the Super Bowl of advertising on television, with Doritos deciding to put $10 million behind a candidate,” Dodd said. Throwing back to his spoof of a sponsored presidential campaign, Colbert said he was insulted. "I like Doritos," Dodd said. "But I don't think they should be deciding who the next senator from Connecticut will be." "I believe our democracy should be crunch-tastic," Colbert fired back.